Favorite 2009 Layouts—Vote for your favorite layouts this year! 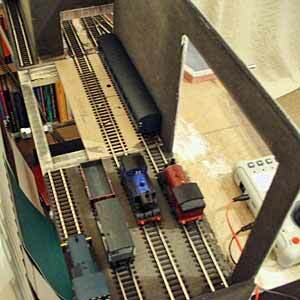 During the holiday season, many modellers turn their hobby attentions toward providing entertainment (and perhaps bait) for children—particularly creating simple continuous layouts where trains run endlessly to the delight of kids of all ages. Now, as we head into a new year and a new decade, let’s look at a more “grown-up” side of minimum-space modeling. This first 2010 page examines shelf layouts, mostly designed for serious switching operations and all less than four feet long. 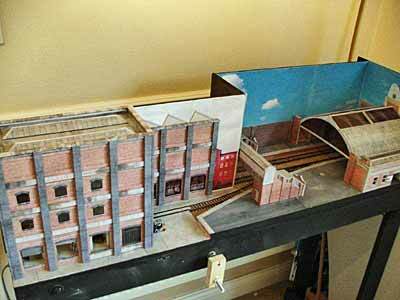 There may be some ideas here for your next small layout! Also, this is the last reminder to send us your choices for the layouts you found most appealing during 2009. See the directions at the bottom of this page… and remember that 10 January 2010 is the deadline for all e-mail votes. 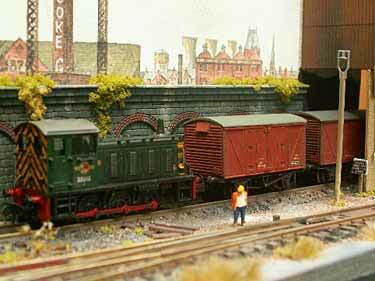 Successfully squeezed into 20x3in (50×7.6cm), Little End Yard is the smallest layout on this page. 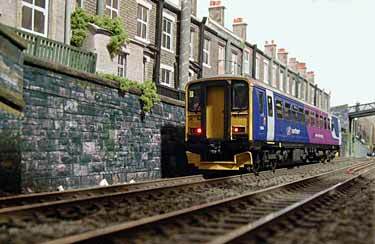 Built by Roger Swan, from Cardiff, Wales, the N scale line uses only one turnout. The baseboard and framework are made from foamcore board, and two switching locomotives (one on each track) handle the shunting chores. 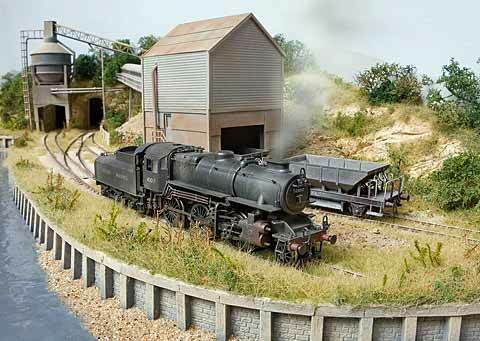 Roger adds, “Rather than use a sector plate or traverser I simply opted to have a two-track fiddle yard, partly hidden behind the building on the left and long enough to hold a loco and 1 or 2 small wagons. The rear track is simply shunted to and fro to the factory which is open at the back to allow me to swap over empty open wagons for full ones. 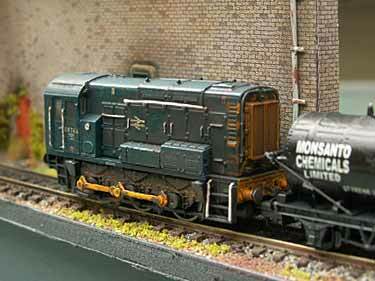 On the line towards the front, an oil tanker or perhaps a couple of vans can be shunted into the siding.” Fairly basic operations, but a lot of fun on a layout that is small, portable, and inexpensive to make. Fourteen-year-old Logan Mazurkewich, from Calgary, Alberta, Canada, chose to squeeze his HO scale layout, Dog River, onto a 30x13in (75x33cm) baseboard. 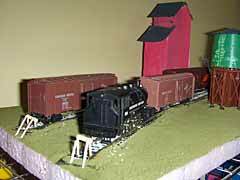 He has mocked up some paper structures to give the appearance of a prairie grain town, with the red grain elevator the most prominent structure. The base is pink extruded foam, and a block of wood with track attached completes the runaround capability and acts as a cassette fiddle yard. There’s still lots of scenery work to be done. 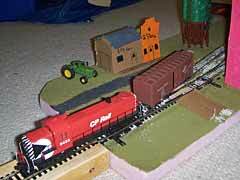 In practice Logan uses a small steam switcher to work with the layout’s one-car runaround, serving the grain elevator. However, he notes, “I also have a CP engine that looks good on the layout but does not work on the runaround.” (This diesel appears in the photos below.) 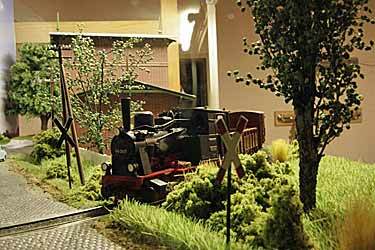 A short construction time and a lot of imagination have gone into this tiny but workable layout. The short runaround loop is usable, but requires considerable patience when operating! Shortliner Jack Trollope, who lives in the Scottish Highlands, has contributed a number of layout designs to these pages, all bearing the name Jaxcilli (say it aloud to hear the pun). Each of these lines juggles empty and full open cars to give the illusion of lots of work being performed with minimal effort on the part of the operator. They’re sort of like a perpetual motion machine in model form (you can see some here, here and here). Jack writes that he awoke one morning with a brilliant idea in his mind. It concerned Jaxcill 3, seen in Scrapbook #44. His insight was that one could use a very-short Trackmobile for motive power (rather than the originally-planned GE 44-tonner) and substitute two 26-foot “shorty” ore cars for the 36-foot hoppers. And he continued, “If you model it as an ore-loading plant, you can fit in a small, double-tracked turntable beneath an ore hopper with wriggly tin covering the sides of the frame and hiding what shenanigans happen inside.” The turntable might well be made from a scrap CD/DVD disk. 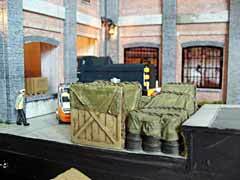 Jack also suggests adding a couple of front-loaders and portakabins (site offices) for scenic effect with a nice dusty backscene. The whole thing will fit in 32x8in (80x20cm) using a Peco LH Set Track turnout and 24-degree crossing. “Begin with the loaded car on the front track under the hopper and the empty car on the rear track behind the hopper. Run exactly as previously described—pulling the loaded car from under the hopper onto the track in front of the traverser, uncouple and use the traverser to move the TM onto the rear track and pull the empty car from behind the hopper (we assume it is from a ‘yard down the line’), then push it across the diamond (crossing) and leave it there. 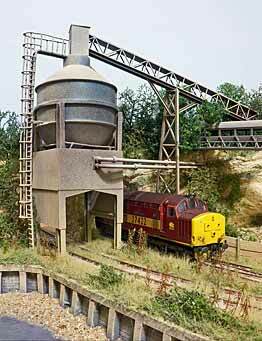 Collect the loaded car via the traverser and take it ‘down the line’ (behind the hopper), uncouple and leave it. Then come back, collect the empty and push it—via the traverser—under the hopper and uncouple. “Now the change: rotate the hidden turntable 180º bringing the full car to the front and the empty to the rear. Then start all over again!” Got that? It’s a wonderful way to occupy a restless winter afternoon. And it makes a great conversation piece at parties! 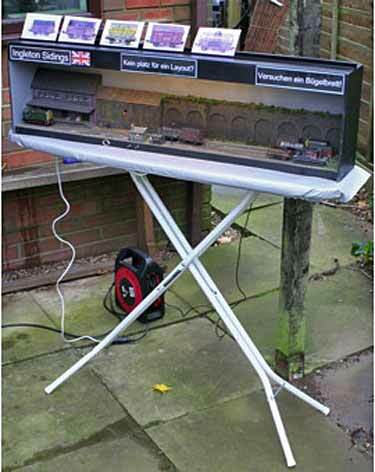 Stephan Besier, from Leipzig, Germany, made this mockup of an H0m railway (12mm gauge) to explore possiblities for using meter-gauge and low-relief buildings to save space. 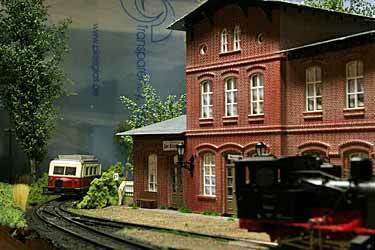 The layout occupies 80x40cm (32x16in) and represents a light railway somewhere in eastern Germany. It packs a lot of action into a tiny space! The unstoppable Jack Trollope has done it again! 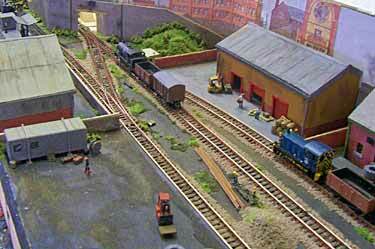 Here’s Fiddlestick Yard, a small H0 layout Jack is building for a competition sponsored by the Wealden Railway Group Personal Layout Show in March 2010. The arcane rules require a layout the size of three A4 sheets of paper laid end to end (891x210mm or 35×8¼in) with 3 to 6 turnouts. An A4-length cassette extension is permitted but may attach to only one track. Jack’s entry-in-progress is typically ingenious and has several good new ideas. The design (above) has a single-car runaround loop, big enough to hold a 50ft U.S. car. Look closely at the puzzle switch in the center. It’s not a double-slip! Jack has interlaced two regular turnouts to create this quite-prototypical arrangement, which saves several inches of length and makes the whole layout possible in the space allowed! 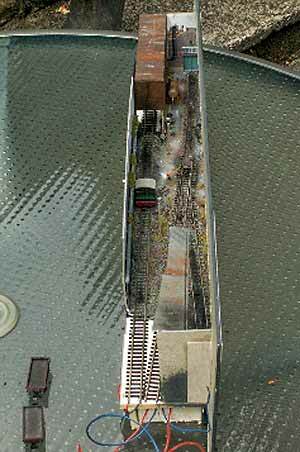 The “stick” protruding from the right side is a support for the Peco Loco Lift that forms the fiddle-yard cassette. Jack explains, “The ‘stick’[lower right] plugs into the end of the board, the mono jack-plug in the stick’s end fits into a mono socket under the board, and the Loco Lift slots on top. Power is routed to the far end of the Loco Lift by wires buried in a slot in the underside of the stick. 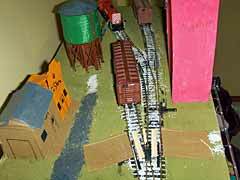 This is ‘belt and braces’ since it should pick up power from the layout track anyway!” Contest rules limit Jack to a single Loco Lift cassette (12in or 30cm long), but for exhibition use he plans to use double-length cassettes made from two Loco Lifts (lower left). The backscene is also unusual. It was created by gray and white spray cans of paint, applied in layers with the gray paint sprayed through a stencil and the white lightly covering all of each layer. Addition of several layers insures that the more-distant buildings will be much lighter in color. The overall effect is a foggy, urban scene and is remarkably effective. 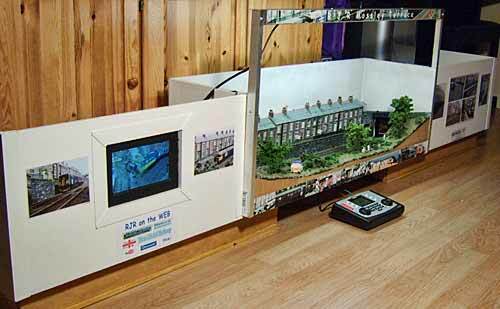 Micro layouts in N scale are a specialty of Andrew Cockburn, from Tyne & Wear, England. 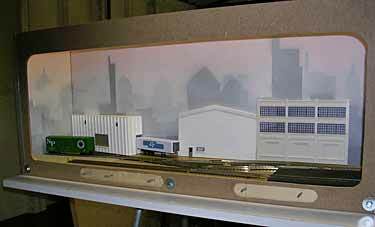 Two recent efforts, each 36x12in (90x30cm), illustrate his point that “something small and simple can be just an interesting as larger and more complex layouts.” Nutt & Bolton (above) is an industrial switching line set in the British Rail blue period, in the late 1970s or early 1980s. 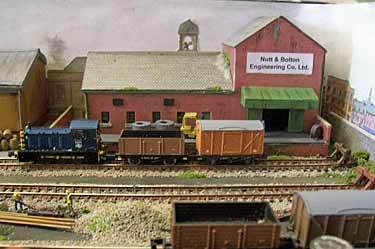 N&B is an engineering company and the largest rail customer in sight, joined here by a small warehouse, goods (freight) yard and a diesel stabling/fueling point to keep the rails and three turnouts polished. 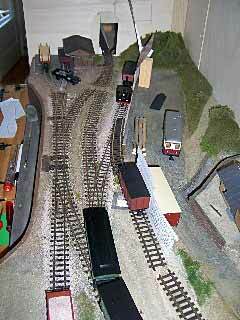 The fiddle yard is a plain stub-end siding, as the layout is simple and trains short (three or four cars), so manual operation works quite well. Andrew turns to the more passenger oriented side of BR operations in Fawcett Street Halt (above and below). Inspired by areas of Sunderland in Tyne & Wear, the late70s-early 80s setting is a former mainline through station that has now been reduced to a simple halt. There is still plenty of operation, however, with a DMU (diesel multiple unit railcar) holding siding and a small goods/coal yard adding to the basic passenger operations of the station. 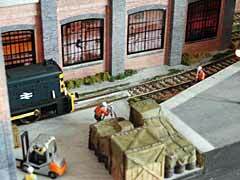 The fiddle yard is a removable cassette, used to keep traffic flowing and the operating crew busy. Fawcett Street Halt took about six months to build. 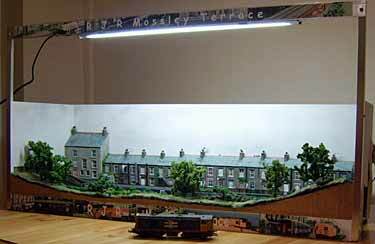 Mossley Terrace was originally built (above left) as a self-contained portion of a connected modular layout by the Cheshire Railway Modellers. 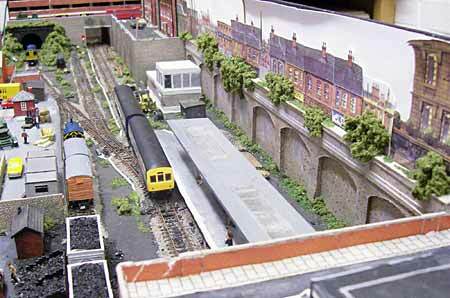 Two tracks simply pass through the layout, and viewers become train spotters watching the trains go by. John Teal, from Springhead, Oldham, Lancs., England, modeled a housing terrace near his home with remarkable accuracy and skill (above right). The module measures 36x16in (90x40cm). 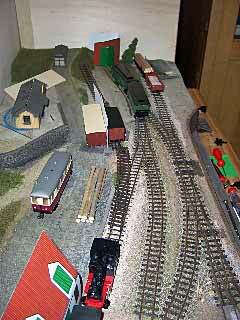 It was so well received that John has added fiddle yards at each end and now also exhibits the layout by itself (left). More photos are here. Francesco Zezza, from Rome, Italy, needed a narrow layout to fit in a tight storage area. So he planted two straight tracks, each 95cm (37in) long on a 10cm (4in) wide board. 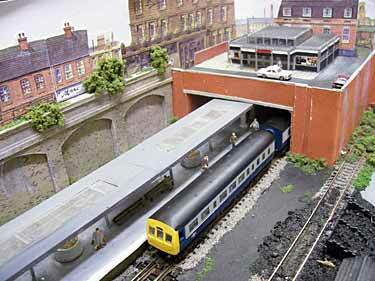 N-scale scenery was concocted from online pictures downloaded from CG Textures and printed out. The result is a locomotive test and run-by track that features a helicopter port and refueling tanks (right), a glass-walled building of indeterminate function in the middle, and an exit to the outer world behind the blue building at the right. The setting is vaguely Brazilian, in honor of Francesco’s six months’ stay there awhile back. A few palm trees and Portugese signs complete the decor. 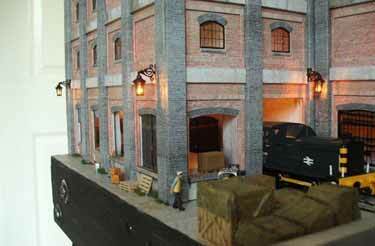 Cement Quay Extra was originally designed as an extension of Chris Nevard’s well-known layout, Cement Quay (see Scrapbook #55a). 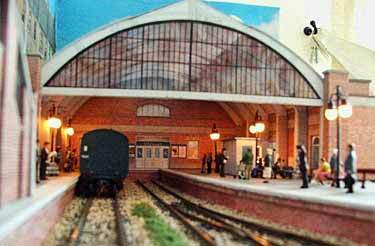 Measuring 42x24in (107x60cm), the new extension had its premier showing at Wycrail 2009 in November (below). Since then, Cement Quay Extra has been packaged to be able to function and be exhibited on its own as well. There are many more photos on Chris’s site here. The all-seeing eye (at left) is a tribute to this site (our version is here) and commemorates the break through the wall of Cement Quay into new territory. As always, Chris’s modeling is awesome! Ingleton Sidings is a straightforward 5-3-3 Inglenook shunting puzzle that at 45x7in (114x18cm) fits on a standard home wndow sill. It’s usually exhibited on an ordinary, domestic ironing board by its creator, Paul Allen, who lives in Basingstoke, Hampshire, England. 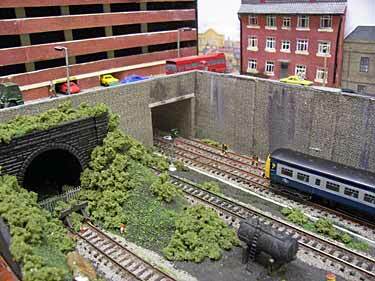 Paul explains, “The layout was designed to illustrate in minimum space what can be achieved with a mixture of customised ‘off the shelf’ products and basic stratchbuilding techniques.” It’s intended as an inspiration for beginning layout builders. When used at an exhibition, the challenge of arranging five cars in a given sequence can take as much as an hour to complete! LAST CHANCE TO VOTE FOR YOUR FAVORITE LAYOUT(S) IN 2009! 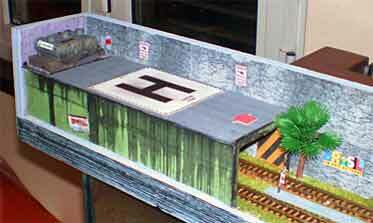 Which layout(s) published in this Scrapbook during 2009 most appeal to you? Reader Nigel Beeton asked me that question, thus prompting me to revisit all the 2009 issues—from #81 to #92a. It was a tough call, but I made my choices and will reveal them to you in the mid-January issue, along with a tabulation of all our readers’ preferences.